Worldwide Janitor is happy to announce that we now offer the full line of Alconox critical cleaning detergents in bulk for a discounted price. 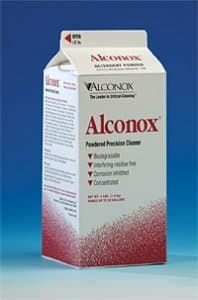 Alconox is the industry leader in critical cleaning detergents and has a longstanding reputation for helping industries such as hospitals and pharmaceutical companies maintain high levels of quality control. Alconox is often associated with critical cleaning. This can mean cleaning of facilities that require great precision, or cleaning that must occur at a certain time or in a certain manner so as to avoid contamination. If your facility requires precision cleaning, you need a detergent that leaves no interfering residues that can potentially cause serious issues. Alconox started in the 1940’s and has decades of experience producing cleaners that you can rely on. When it is crucial for your facility to avoid contamination and/or cross-contamination, Alconox is the detergent you need. Each Alconox cleaner is tested rigorously so that you can trust that it will meet the needs of your critical cleaning facility, whatever they might be. Order your Alconox cleaner at a discounted price right here on Worldwide Janitor! This entry was posted in Critical Cleaning, Safety and tagged alcojet, alconox, alcotabs, citrajet, citranox, detergent 8, detojet, liquinox, luminox, solujet, tergajet, tergazyme. Bookmark the permalink.